These innovations launched in an effort to discover alternative solution towards issue in various areas, namely education, environment, technology, and many more. However, it’s also important to highlight that quality innovation can be made possible through collaborators who give constructive feedback, challenge the hypothesis, and stubbornly ask various questions during the creative process. Thanks to XL team & facilitators who generously play the role as collaborators for their innovations. Pipet Kite is a project which not only helping to reduce the number of plastic especially straw but also a project which focusing on women empowerment to enhance their economy creative by making a reusable bamboo straw. So it hopes to sharpen their skills and creativity, furthermore it can help to increase their income. Jagoku is a platform that helps professionals and students to increase their skills and ability through official workshops and certification training, then they can have a better chance to compete in the world of career with others. Jagoku will provide an official information such as schedule, place, and price, from BNSP (Badan Nasional Sertifikasi Profesi) or other official institution, share it to the forum, and educate people about the importance of certification so people can choose their desired certification. This platform will record in the database people who have certificate from any sector, this feature will facilitate the company that needs to hire people with certified competences so the problems on the need of the labor can be solved quickly. Foodie Feedie is a web-based application that aims to reduce the amount of food waste. It connects the companies that own leftover of edible food to the buyer; selling the leftover foods with discounted price. Foodie Feedie accepts leftover food donation from events and money donation through the website, which will be delivered to those in needs. TTM Card is a unique interactive card game as a self-expression tool for toddler to speak out “thank you, sorry, please, and excuse me“. Those four magic words are expressed by one single picture in card and played with toddler. This game requires a guide (can be sister/brother/teacher/parent) to help toddler understand what should they say when the experience situation like in card. Dinding Berbudaya is a movement that aims to replace the vandalism and irrelevant murals with the educative ones. This activation takes a place in Taman Budaya Raden Saleh Semarang, where the irrelevant mural located. To reach the goal, we clean the old, vandalist mural, adjust new mural with cultural topic that sticks with Semarang, and persuade public to join the campaign. Dinding Berbudaya project also engage with artists community, Dewan Kesenian Semarang, and Taman Budaya Raden Saleh to create a wonderful campaign. 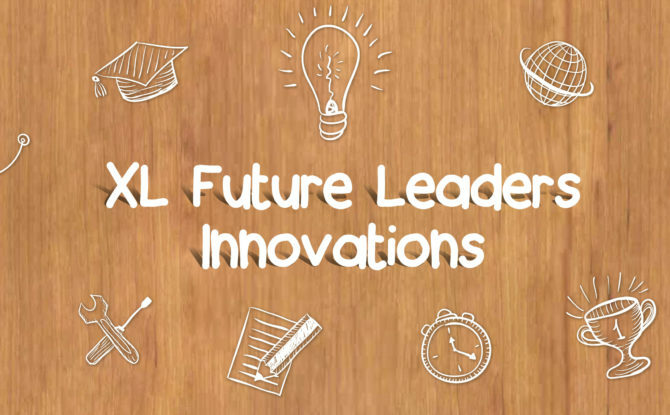 XL Future Leaders look forward to creating more innovation in the near future. We believe great leaders are those aspire to do more and go extra-miles. We believe great leaders start here.